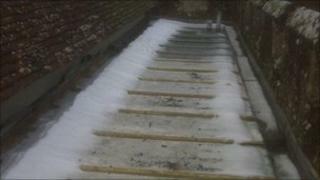 A Kent church has been targeted by lead thieves for the sixth time this year. The latest theft of lead from the roof of All Saints, in Woodchurch, happened last Thursday night. The Reverend Paul White said repair work to make the church watertight again would cost about £60,000, plus extra to install an alarm. "The church has nothing like this sort of money in the bank and it is going to be hugely difficult," he said, adding that it had been "a significant blow". Mr White said the church had only just raised enough money to install a small kitchen but this would not now be able to go ahead. "It has been a significant blow to the local church and we are going to need the whole local community to rally around to help us raise the money," he said. "Obviously the timing is not great either, coming as it does just before Christmas."